HomeApartment LivingCan You Evacuate Your Home in 90 Minutes? Listening to the news today about flooding in the wake of Hurricane Isaac, we heard about residents near Lake Tangipahoa Dam in Mississippi being ordered to evacuate, due to damage to the dam and possible flooding. About 60,000 people were affected. Fortunately, as of this writing, the dam has not failed as emergency management personnel are trying to patch it. Mr. Apt Prepper and I had a long discussion about what we would do if were in that situation. I was getting stressed out just thinking about it. If you live in the ground floor or even the lower floors of the apartment building, in a low lying area, your home is at a high risk of flooding. If you lived in a higher floor, your belongings may be spared getting soaked, but you’d still have to evacuate to avoid getting stranded. Even if the home is spared from flooding, there is always a possibility of looters taking advantage of empty houses. You’ll want to lock up your home as well as you can. Make as list of anything you would not want to lose so you know what to grab in an emergency. To avoid panic, each family member should have a designated task. One can grab the computer and any small electronics, someone else can grab the safe that has important documents, smaller kids can go to their room and take their favorite stuffed animal etc. Having a bug out bag or go bag ready for each family member will also save time, instead of having to pack clothes, shoes, first aid kit etc. Most emergency shelters do not allow pets. Make arrangements with relatives now, just in case. Or, look up hotels or motels that are pet friendly, so your family and pets will have someplace to stay until it’s safe to return. If you had to leave your pet behind, leave plenty of food and water. 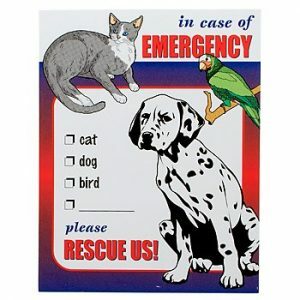 Window stickers indicating the presence of pets can be left for emergency personnel. A cash stash would really come in handy for a hotel stay. Don’t leave home without it. Most renter’s insurance does not cover flood damage – review your policy on what is actually covered; if you live in a flood prone area, you may have to consider flood insurance. Don’t forget to notify family and friends regarding your whereabouts. Hurricane and flood prone areas are not the only ones at risk for evacuation. Brush fires, hazardous chemical leaks can also cause a sudden evacuation. Everyone has different circumstances: it is up to each of us to come up with a plan. Give this some thought now, before anything happens. 6 Comments on Can You Evacuate Your Home in 90 Minutes? I noticed on your link to the anything you wouldn’t want to lose article, that some of the commenters were worried about how to deal with their cats if they had to walk out. When we were driving truck,my husband and I trained our cat to walk on a leash.The younger you start them the better. Hi Connie, I wish I had know you can train cats to walk with a leash. My cats are about 7 years old, I wonder if they are still trainable. I think I have an old leash I will try out. Thanks for the idea. Good idea to put a time limit on evacs. I’ve got our family on a 15 minute, one hour, and one day plans. Hopefully we’ll never need them. Being able to evacuate in 15 minutes is great! Good to have that ability. Awesome ideas Bernie as is customary! Growing up in San Diego, my family dealt a lot with wildfire and earthquake evacs. One thing families in our area did that was really clutch was they had most of their “sensitive” stuff in one closet–important docs, phots, memorabilia, keepsakes, etc. (as well as their BOBs). Hey Dan, Good idea color coding the boxes with important stuff. I will add that to our routine. Thanks!